Operation Meatball is the efforts of three sisters, Liberty, Jubilee, and Faith, dedicated to Honoring Veterans and Connecting them with the Youth of Today. When did Operation Meatball begin? Our awareness of and love for WWII veterans started in 2005 when we participated in the 60th anniversary of Iwo Jima held in Fredericksburg, Texas. A few years later, our family traveled to Normandy for the first time and took part in the anniversary of the D-Day Invasion. 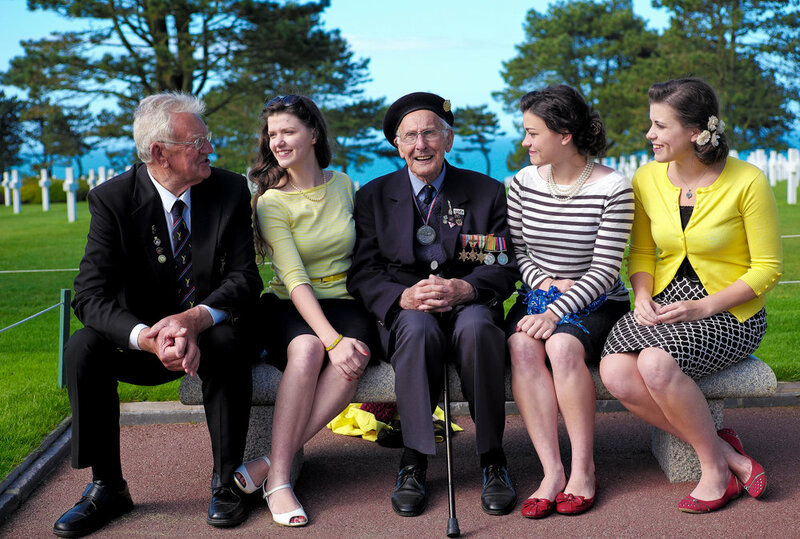 The veteran friendships we formed there left an especially deep impression on us, and we were deeply impacted by the shortage of time we have with this unique and special generation. So during the summer of 2014 the three of us decided to commit the next three years to honoring and showing gratitude to the veterans of the Second World War. 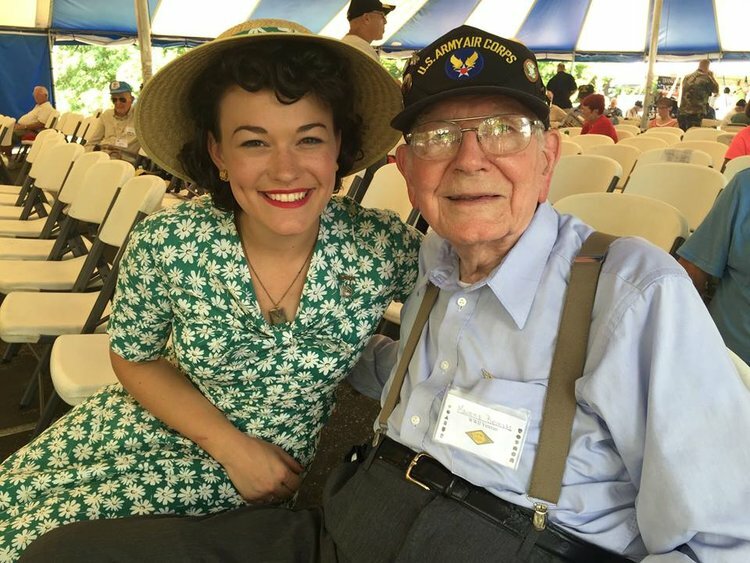 We did this through hosting events for the veterans in our local area, making house visits to veterans unable to travel, attending military reunions and WWII events with the purpose of meeting and interviewing veterans, volunteering with Honor Flight, greeting at the WWII Memorial, and recorded 3 CDS of WWII Music for the veterans. Over the course of the three years we traveled over 200,000 miles, collected hundreds of stories, and met many, many wonderful veterans of WWII. The richness of the experience is almost indescribable. However, as the three years drew to a close we realized the mission of honoring our veterans was too important to stop. With just a few years left with the last veterans of World War Two, the urgency is heightened. We wanted to take every moment we can to honor these dear men and remind them and the world that their sacrifices were not in vain. Up to this point everything OM did was out of our own personal savings. In order to be able to continue our mission, we made the decision to turn Operation Meatball into a 501(c)3. On December 7th, 2017, (Pearl Harbor Day), Operation Meatball was officially formed into a non-profit Organization. Our mission remains the same, honoring World War II veterans and connecting them with the children of today. However it is now extended to include our Korean War & Vietnam Veterans. Visiting veterans in care facilities or in their own homes is a significant part of Operation Meatball. Taking them out to meals and local events reminds them they are valued members of the community with important contributions to make. It also gives them the opportunity to share important memories in a comfortable setting. Taking down the veteran's oral histories is an important part to the Operation Meatball mission. The video, audio, and written interviews capture the veteran’s life and war-time experiences, but also include personal reflections from their childhood, family life, and how the war affected their future careers. This is vital to understanding the individual, preserving their place in history, and educating future generations. Music is a well known connector. It brings back long-forgotten memories. Sweet ones, sad ones. It reminds them of days far in the past, their old girlfriends recordings of music from the war era of our veteran members, with the purpose of gifting the cds to the veterans, free of charge. This brings encouragement to the veterans, stimulating positive memories from the past and introducing their music to modern generations. The OperationMeatball.com blog, facebook, and instagram are a means of communicating the stories of the veterans, teaching the history of the war through compelling personal anecdotes of the veterans, raising awareness of this valuable part of our community which we are losing, and connecting the older generation to the younger generation. While most communication today is conducted via text or the internet, regularly writing physical letters to veterans for birthdays, anniversaries, holidays, Veterans Day, Memorial Day, other special events, and just simply to stay in touch keeps them connected, reminds them of their value, and brings back fond memories of the “Mail Call” they received while in the service. Operation Meatball is a 501(c)(3) under federal tax guidelines.